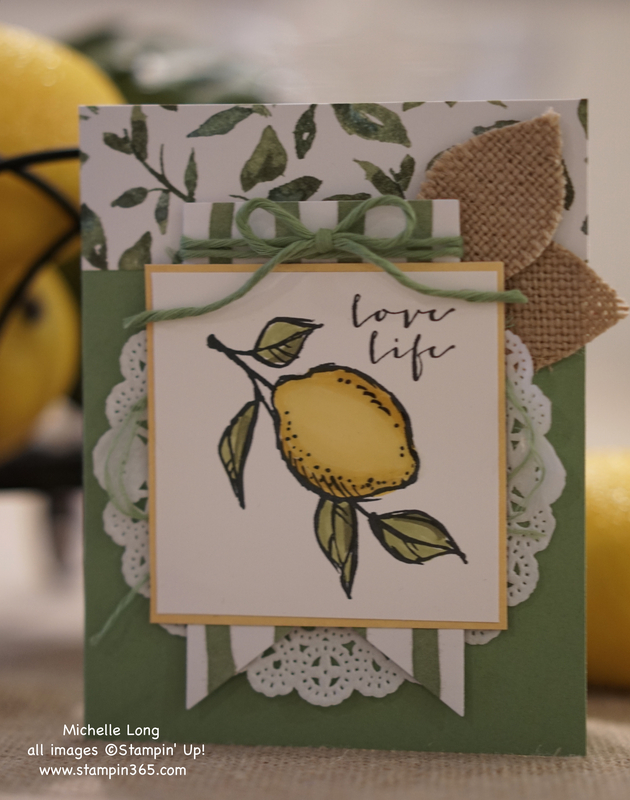 This lovely lemon is part of the “A Happy Thing” stamp set, available free during Sale-A-Bration. What’s even better? The Blendabilities are also available free! For this card, I used the free stamp set and two sets of free Blendabilites, along with a Memento ink pad and Crystal Effects. In the light, crystal effects really brings the lemon to life. I tried to capture it on film for you, although it is even more amazing in real life. I am excited about several things with this card. First, I am so glad I finally added Blendabilites to my collection- after only a little bit of practice, I was very happy with the results. I will definitely be using them regularly. If you decide to try them, remember that you have to use the Memento ink pad to keep the image from bleeding. Next, that Painted Blooms paper is so amazing! I simply love paper and the watercolor look on this set is gorgeous. 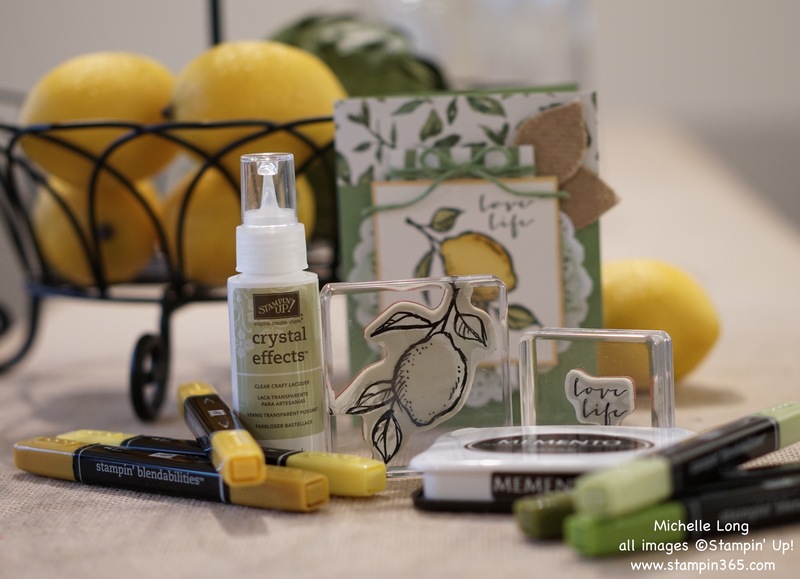 Thirdly, I had been waiting for a chance to use Crystal Effects and that lemon is perfect. Lastly, during Christmas I had tried cutting the leaf from the Flower Fair die cut set on burlap ribbon, but I hadn’t found a way to use it yet. It adds a nice texture to this card. In the cold gray of January and the ongoing sadness of world events, card making is a beautiful way to be creative and use our talents to reach out to others and share a little love. I hope your day is filled with good health, lots of love, and of course time to craft. Beautiful card, Michelle. Your mom is right….you are very creative and talented. Thank you, Sandra. That means so much to me that I actually got happy tears in my eyes when I read it. I hope you have a wonderful day. Thanks for making mine better with your kind comment. Love this card & love that scripture & love you!! Thanks mom, you’re the best. LOVE this card! 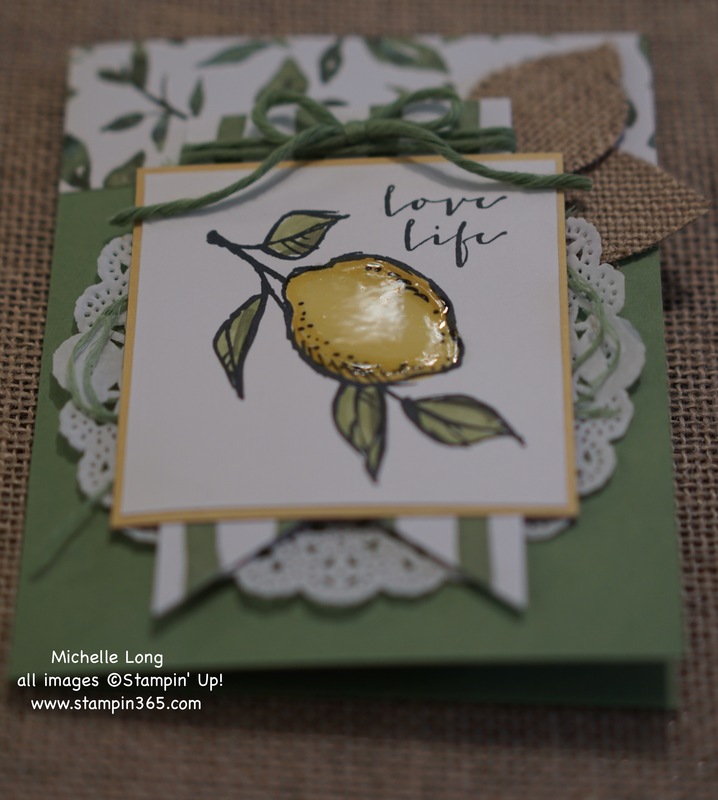 The lemon looks great and the burlap leaves are a nice touch. I could go on and on. Thanks for you scripture and your words at the end of the post. Have a blessed Sunday. Thank you, Jeannette! It’s so nice to receive such kind comments. I hope you have a blessed day, too! I always love seeing the cards that you make! You have a gift of seeing how they go together and thinking of new ways to use things. I always look forward to seeing what you will come up with next! Wow, thank you, Lisa! That means so much to me. I’m so glad you took time to comment.